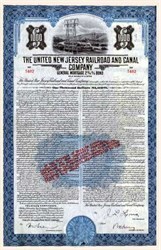 Beautifully engraved Certificate from the United New Jersey Railroad and Canal Company issued in 1951. This historic document was printed by the American Banknote Company and has an ornate border around it with a vignette of a train passing under power lines. In 1951, power lines were a sign of strength and connectivity with electricity. Nowadays, everyone wants to stay away from power lines because of possible harm to their health. It just shows how times have changed. This item is hand signed by the company's officers and is over 50 years old.